Logo mats are the perfect way for your company to project a positive first impression, whilst protecting your internal floor coverings from ingressed dirt and moisture. Jaymart logo mats are manufactured using the latest computer technology to reproduce your logo, custom-cutting accurate inlays to produce exceptional results. Choose from a variety of colourful material insert options for your logo mat: Our Coir Logo Mats have long been established as a proven bestseller. Using only the best top quality coir our pvc backed coir logo mats are made to order. Why not upgrade to our In-genius polypropylene brush rubber backed entrance matting, which is unlike coir matting is colourfast, making this and ideal material choice for logo entrance mats. 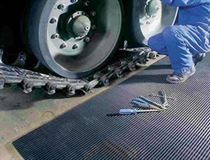 Alternatively the Aluminium Logo Entrance Mats is our top of the range mat, specifically engineered to withstand extra heavy footfall, the Aluminium logo mat range continues to be used in airports, shopping centres, supermarkets, department stores, cinemas, universities, race courses and hospitals, and is ideal for applications where performance under the severest of traffic conditions is required. In addition to our traditional matwell logo mats we can also supply popular throw down barrier logo mats, both inlaid and printed. Our printed logo mats use advanced dyeing technology to ensure a deep and intense colour penetration. Colour is locked in to give your logo mat greater colour retention and a longer life. Boasting a standard colour palette of 99 colours, plus 700 more for special orders, all printed logo mats are nitrile rubber backed and have anti-trip edges to all 4 sizes. Printed logo mats can also be supplied with extra thick backing for matwell use. You simply supply us with your logo and we will supply your entrance with a prestigious top quality inlaid logo mat to help you to always make the very best first impression. Please check with our sales office for lead times on printed logo mats.